"Hey Medusa, I've been following your blogs for quite some time now through my ups and downs with my eating disorder and now I feel like I am in the right mentality to send you in my story. My name is Alexis and I'm 16 years old. Everything began in year 5 when I was being teased about my weight. I wasn't eating unhealthily, it was just puppy fat. I mean come on, not everyone grew up rake thin. That was when it really hit me. I began to throw up after meals, satisfied with myself for a few weeks where I would stop, and then the cycle would begin again. 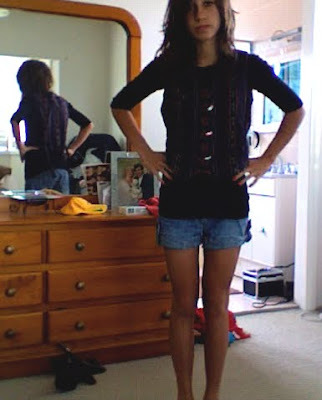 This went on until year 8 (14 yrs old) even when I had lost all of the puppy fat and was at a healthy average weight, but from all the years of teasing and self-loathing I couldn't see what everyone else could. It was Easter afternoon after eating my fair share of chocolate when I decided I was going to change, but this time for good. I would vomit, exercise, and make my intake increasingly smaller. At the time I had been playing soccer for 7 years and was just accepted into a rep team, which meant two 2-hour training sessions a week with a game on the weekend, which at the time it didn't occur to me my torture to my body would eventually take its toll. There hadn't been a day for a year after Easter that I didn't stick my fingers down my throat. I began to get acid reflux, dizzy spells, and all along with that compliments on how beautiful and amazing I now looked! You see, my mum and I have an amazingly close relationship, but at the time she didn't know any different. She put the weight loss down to all of the exercise I had been doing with soccer. A few weeks later and my mum said for me not to lose any more weight and that I looked great as I was. Unfortunately all of these comments off everyone just pushed me further and further. 6 months after Easter I broke down, I hated myself, and everyone else for some reason and it had been so long since I'd been the outgoing girl everyone once knew me as. I ended up telling my mum, and that week we went to go see someone. Too bad that the psychologist didn't specialise in eating disorders, as with the visits, my weight got steadily worse because she didn't weigh me, and my eating disorder decided to cover everything up even more. I was lying to my family, my friends and most importantly myself. "Just one more kg, one more sit-up, no more eating" It's all lies! You're never going to be happy with yourself when you have an eating disorder! So this went on for a while and then my mum took me to another psychologist, this time specialising in eating disorders. She was great, but my ED didn't want ANY help whatsoever. No matter how hard I fought to implement the things she was teaching me, I couldn't let myself. All of a sudden she began talking about hospital, you see; she used to weigh me. "One more kilogram and I'm booking you an appointment with the paediatrics doctor at Westmead". Slowly I fell into a cycle of binging and purging, to the point where my eating disorder would wake me up at 4 am to drag me into the kitchen only to feed myself like a robot and then bring it all back out again. I had to get out of the cycle, so I told my psychologist. She suggested putting locks on the cupboards but even that didn't stop me. I'd find the keys when no one was home, or I'd shovel food in my face at a party then come home and... you get the point, it was HORRIBLE. It was literally dragging me away from my friends. I couldn't go out? Why? BECAUSE I HAD TO BINGE. Oh wow, heaps fun.. Not. It got to the stage where I was begging to go to hospital, just in the hope that I would get relief from this stupid thing inside my head. So we booked the meeting with one of the doctors, and even though I wasn't unstable, the next day I was in the car on the way to the hospital. I step into the ward and the first thing one of the girls asks me is how much I weigh. I told her and she just laughed at me, which was really great as well, kind of just implementing how fat I thought I was. Looking back I think of how screwed her head was... I was 46 kg at the point and had come from 60 kg. Hospital is just a big competition filled with eating disordered girls. If you didn't have an NG tube, lose weight on your gatepass, eat slow enough, exercise in privacy, use laxatives/purge they'd look at you as though you were fat. I was in the hospital for a month and got back up to 50 kg but when I got home things worsened and I was now on weekly weigh-ins at the hospital, and my head was throttling me. I plummeted over the next two months with the pressure of summer and looking skinny for my birthday. I weighed in a week before New Year's at 43 kg, because I'd gotten sick of water-loading and wearing weights equivalent to 5 kg under my clothes. But even with my silent cry of help, the doctor let me stay out in hope that I'd help myself, which of course was reallllly smart of him. It got to the stage where I refused anything on offer to me. In my head I wanted to be as skinny as possible for hospital because I knew that was where I was going. A few blackouts later and I was in emergency a week after my appointment, at the Children's Hospital, sitting under a heater with nurses trying to get my temperature above 34 degrees. I was admitted with an NG tube at 40 kg and all I did was cry. My parents cried and the tears wouldn't stop coming. I missed out on summer, a whole summer spent inside the hospital while my friends were at the beach with 40-degree heat. I missed out on parties, Australia day, my best friend's birthday, school photos and the beginning of year 10. Three months later I was discharged at 51 kg, the minimum healthy weight for my height, and determined to make the most of my life. Those three months were a constant struggle, but my family supported me and I tried as hard as I ever could. Recovery isn't about going brilliantly all the way through, it's about going high up, and then tripping and stumbling but having the will to be honest with everyone and get back up on your feet and start climbing. It's now December, nearly a whole year later, and the only reason I cry now is because I regret wasting so much time. Of course my eating disorder is still on my back, whispering in my ear, and I've just pulled myself out of 2 short-lived relapses which I couldn't let continue any longer. I'm currently sitting here typing this at 55 kg, the highest I've been since after the beginning of all of this, and guess what... I'm happy and I love myself! Each day is still a fight, but it really does get easier :). Medusa, thank-you for taking the time to read my story, and if you could please share the message that you CAN and WILL recover if you put your mind to it. It's not anyone else's decision, it's yours and even if you have the greatest support in the world, none of it will matter unless you want to recover and live a life free from eating disordered thinking. Alexis, I am so happy for you. What a journey you had to recovery. You are so beautiful, and looking so healthy in your "after" picture. Thank you so much for sharing your story, Alexis. You are such an inspiration to those who are struggling. You have given them something precious: Hope. Alexis you are so pretty and write so incredibly well. You write raw, from the heart. Incredible story of such pain and misery that I am truly sorry you had to endure. I so related to your first hospital trip as girls were like that to me the first time I went to Remuda Ranch 11 years ago. I was only 25 below normal just shy of g-tube. I didn't do well in their 2 month program and vowed next time I would be a lot skinnier. I succeeded to getting 50 below but also succeeded at ketosis, dental problems, heart arrythmias, pottassium deficiency and the list goes on. recently I spent 3 months in hospital and was well below again but this time it didn't matter that I was one of the more skeletal ones because they didn't focus on it and it really helped me to get better and focus on the pain. There is no success in anorexia and bulimia unless it's death! Blogging, Medusa's site and encouragement, and my wonderful therapist all help keep me grounded in recovery which is a daily decision! wow..your story is exactly the same as mine. Literally from beginning to end. You look great now. Notice in your most recent picture that smile. Your smiling! In the fist picture you may be skinny but you look miserable. And thats how I rationalized my ED. I would rather look like everyone else and be happy then rail thin and miserable. Greetings from Turkey. Though I don't have an eating disorder I feel the pressure to have one every day. When I walk the streets, when I turn the pages of a magazine, when I watch tv or even when I log in to facebook, I face the graphics which say that I must loose some weight..but that's so wrong! That only makes me feel bad! The meaning of life is to be happy and healthy and not to feel bad. I am so proud of Alexis! I hope all the women and men would someday be happy with their healthy weight and not to try to fit in to some synthetic shape made by others for any reason. I wish everyone a loving family or friends to support them. peace and patience to everyone in this site, wherever and whoever you are, you are precious! sorry to hear you had to go thrue this, comments from other people can cause so much damage. They dont know how this can turn a young girl into an ed..if they only knew better..
i'm glad to hear you are doing better, and that you fight back. An ed is not easy to get out of, but you have done wonderful,and i hope things will only get better for you. I'm so glad that you have managed to come out the other side of this awful, awful black hole. I missed out on my last year of sixth form because of two admissions to hopistal due to anorexia, and now i have slipped into bulimia. Your story is truly inspiring, and you look so beautiful in that final picture. You are so strong to have overcome your ED, and brave to have shared it. Thank you. Hey guys, I just watned to say thankyou for all of your kind words and for taking the time to read my story. Please keep fighting, it's a battle definitely worth accomplishing.